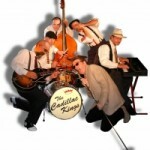 Featuring six of the UK’s top blues & roots musicians, The Kings play music inspired by the sounds & styles of the ‘40s & ‘50s. A mix of mostly original songs with a few well-chosen covers from the likes of T-Bone Walker, Roy Brown & Champion Jack Dupree have made the band firm favourites on both the blues & jump-jive scenes. With their stunning musicianship & exciting stage act, this is a band that knows how to entertain audiences across the board, from arts centres to dance-halls, from intimate clubs to major festivals. 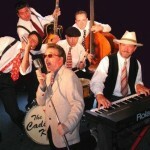 With backgrounds including Otis Grand’s Band, James Hunter’s Jokers, The Poorboys, Big Joe Louis, and Little George Sueref, The Kings came together in the year 2000. 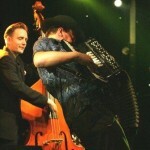 They became an immediate hit at venues & festivals all over the UK. 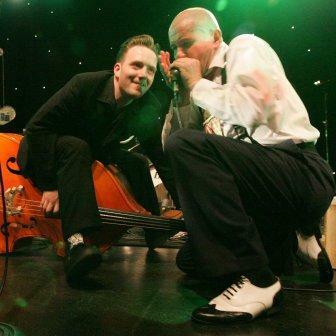 More recently, and for the third year in succession, The Kings have won the categories for ‘best blues band’ & ‘best harmonica player’ in the 2005 Wychwood Brewery/ Running Horse Awards, as voted for by the audiences at Nottingham’s top live blues venue.